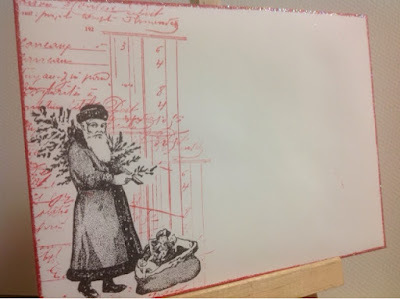 Posting this Christmas card for the VivaLasVegaStamps challenge. I was inspired by their beautiful moodboard (red, white, stripes, glitter, mail art, Santa, black-and-white...), actually the thought of red didn't even feel as intimidating as usual! Besides VLVS I'm posting for the SimonSaysStamp Monday challenge (Just a Pinch...of glitter), the Craft Stamper challenge (Sharing the Season) and the WOW challenge (winter... well Christmas is supposed to be winter even though it doesn't look like winter here). All the used stamps are from VLVS. I started by stamping the lovely bird tree onto Crafty Individuals Satin card with Distress inks (Festive Berries, Barn Door and Aged Mahogany) and heat embossing with clear embossing powder. 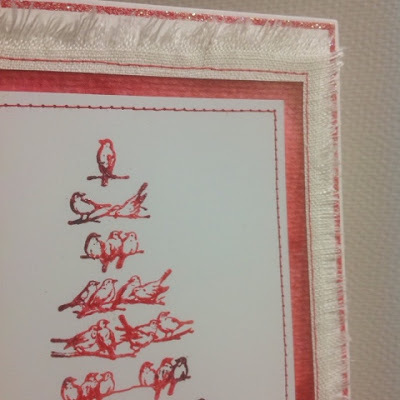 I matted it on an inky red piece of watercolour paper and sewed around it. I originally planned to place something red under the torn linen, but it gave the fabric a pink glare so I cut white paper, drew around it with an embossing pen and heat embossed with Strawberry Crush embossing glitter from WOW. 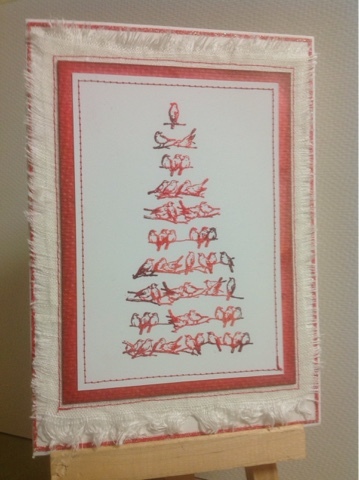 I wanted the matting to give some extra stripes besides the tree itself, so I sewed over the fabric with the same red thread used on the previous layer. As for mail art... 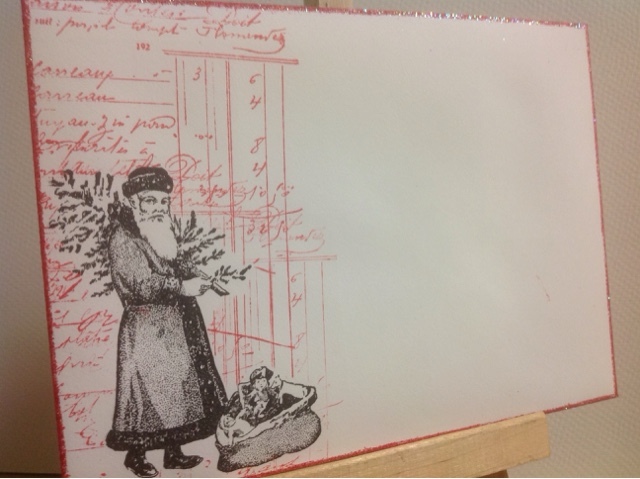 I wanted to try the black-and-white colour combination with the Santa theme, so I stamped Vintage Santa with black ink, masked him with washi tape and stamped over with the ledger stamp and Barn Door DI. I also wanted something in common with the card, so I went around the edges with the Barn Door inkpad and added more Strawberry Crush. Some red smudges, but I don't think anyone who receives this will mind. Besides my cards for this year are already done and sent, this might well end up waiting until next December! Great job! Thanks for sharing with us at VLVS!! LOVE your creation for our challenge at Craft Stamper.